Flea Control in Hemet, San Jacinto, Menifee, French Valley, Winchester, Murrieta, Temecula, and surrounding cities. Fleas are tiny ectoparasites that feed on humans, domestic animals and other wildlife. The most common flea that affects humans and pets is the cat flea. Despite its name the cat flea is not host specific, but is the flea that commonly afflicts dogs, cats, birds, rodents and humans. Over 90% of fleas found on domestic animals are cat fleas. The dog flea is rarely encountered in North America. Flea control is important for your family and pets environment. Outdoors fleas are found beneath patios and decks in shady locations protected from heat and sunlight. Fleas infest grass areas that are frequented by animals. Fleas are wingless blood feeders that require a blood meal from a warm-blooded host in order to survive. Fleas are of medical and veterinary concern because they feed on blood. Flea bites can be painful and bothersome, causing itching, irritation and other reactions, including dermatitis. Fleas are also vectors of disease and can carry and transmit various diseases, such as plagues, tapeworm, encephalitis, tularemia, Lyme disease and other human pathogens. Fleas need a blood meal to survive. Female fleas lay 4-8 eggs after each blood meal and can lay up to 500 eggs over their lifetime. Fleas lay eggs while on their preferred host. The eggs have nothing to attach to and readily fall from the host, landing in the host’s environment and hatching in carpet, bedding and upholstered furniture. Cat flea eggs hatch within 1-6 days. Homes without pets are also susceptible to a flea infestation. Rodents, birds and stray cats can introduce a flea problem into a yard. Fleas can be easily transported to a new location via infested blankets or on shoes and pant legs. AmeriGuard Pest Defense provides flea control services. Our licensed service technician will perform a thorough visual inspection to identify the severity of your flea problem. During the inspection, all sources of the infestation will be identified and methods of flea treatment will be discussed. The technician will also point out potential flea harborages, flea evidence and suggest mechanical methods of flea control where available. A successful flea control service depends on the cooperation of our customers. The Flea Control Preparation Checklist is available for download. This checklist must be followed carefully to ensure a successful flea control service and to ensure that your home will be rid of any flea problems. A One-Time Flea Control Service usually includes a follow-up service 7-10 days after the initial flea treatment. Flea treatment services are available on a One-Time basis or as part of an ongoing Monthly and Bi-Monthly General Pest Control service. An exterior flea control service can be added to your regularly scheduled maintenance plan. 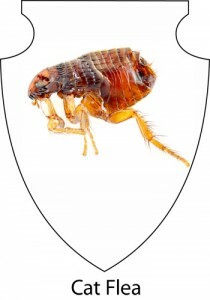 If your property is re-infested with fleas frequently, our service technician will advise of the best course of action for controlling your flea problem. Effective flea control can be further improved with the assistance of our customers. Below are a few tips a homeowner can perform to reduce the likelihood of an earwigs infestation. Pet Control – Keep pets leashed while outside on walks. Groom pets regularly and often, paying special attention to excessive licking, itching and scratching. Clean pet bedding and toys frequently. Schedule regular veterinarian checkups and discuss flea prevention with your pet’s doctor. A good flea control service begins with proper preparation. The Flea Preparation Checklist provides information for how to best prepare for a flea treatment service. Contact your flea service experts at AmeriGuard Pest Defense for a flea treatment quote. Most quotes for residential flea services can be provided over the phone without any obligation. AmeriGuard Pest Defense’s Flea Maintenance Program will help eliminate current fleas as well as help prevent a future flea infestation. Catching a flea infestation early will ensure that it is taken care of quickly and efficiently. Flea Maintenance can be added to any General Pest Control Maintenance Program for a minimal amount. No contracts required!